Saw Captain America: The Winter Soldier and really have nothing bad to say at all. There were a few issues with story logic but outside of minor nitpicks, I’d have to say this is as good as The Avengers and definitely the best “solo” Marvel Cinematic Universe movie to date. The best way to describe this movie is “balanced.” It achieved an almost perfect balance between comic book-style action, humor, character development, and story sophistication. Taking a page from the Robert Ludlum/Tom Clancy school of 1970s-era Cold War espionage pop culture storytelling, The Winter Soldier (at the very least) establishes a formula for Marvel Studios that, if used repeatedly, should guarantee the cinematic dominance of Marvel IPs for the next generation. Expertly adapted from the critically-acclaimed, award-winning Captain America comics series run from writer Ed Brubaker, the movie takes the source material very seriously — and as a side note, if you haven’t read the story this is based on, I would strongly suggest you do so immediately — and spins the direction of the entire Marvel Cinematic Universe to a place no fan could have imagined. What carries this film are the performances from the core cast: Chris Evans has grown on me as an actor — and it is somewhat disappointing to learn that he wants to retire from the role when his contract expires — but Scarlett Johanssen, Anthony Mackie, Robert Redford, and Samuel L. Jackson turn in strong, somber moments that propel this beyond the pulp trappings of Thor and the last two Iron Man films. The actors seem much more relaxed than in Avengers, and it feels like they’ve been given more freedom to explore the characters and not worry so much about corporate blowback from Marvel Studios or their parent company Disney. Evans has great chemistry with Mackie, Jackson, Redford, and Johansson, and all their scenes feel natural with the right amount of dread when necessary and levity when you least expect it. The identity of the “Winter Solider” is not a shock to anyone who’s read the comic books or paid attention to all the press releases from Marvel Entertainment, yet, we all sat there waiting for the big reveal of Bucky as the Soldier, experimented on by Arnim Zola to be the Nazi/Hydra version of Captain America. The fallout of the super conspiracy within the Marvel Universe and what this means for Avengers: Age of Ultron and Captain America 3 is just plain awesome. This movie pushes Captain America from being a B-level punchline in the pantheon of costumed heroes to a legitimate superhero in the eyes of the (non-comic-book-reading) audience. The story unfurls at just the right pace — when the character development reaches its apex, then a massive-action-set-piece drops into the script. To continue on this point, Marvel Studios has basically trashed the convenient existence of S.H.I.E.L.D. (and this makes me wonder what this means for the TV series Agents of S.H.I.E.L.D.?) and created a new, more dangerous, less predictable and an altogether shadowy status quo. Sort of like a combination of the gritty-post-Mike Zeck Punisher 1980s Marvel Universe and Ed Brubaker’s vision of the spy-comic 2000s Marvel Universe. As a longtime viewer of comic book movies, it was nice to see well-choreographed fight sequences using real-world martial arts. That, I think, represents the mindset of the filmmakers: inject just enough “reality” into the movie to grab the attention of even the most ardent anti-comic book moviegoer and then dazzle them with incredible stunts and the trademark big Marvel-finale. The diversification of the Marvel heroes on screen is important for the continued growth of the brand and to capture younger viewers of all backgrounds. With the exception of Blade, Anthony Mackie’s Falcon was the first Black superhero featured in a Marvel Comics movie (Sam Jackson as Nick Fury doesn’t count, and neither does Idris Elba in Thor). 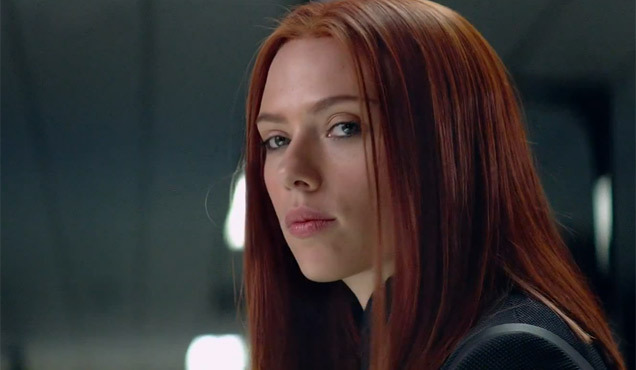 The exploration of Black Widow’s background and character motivation is just enough to whet our appetites for the eventual Black Widow movie (and after her performance here, I’m certain Scarlett Johansson can carry an action movie on her own — as we shall see this summer in the Luc Besson-produced Lucy). One other thing, I never understood why everyone thought she was “hot.” But after this movie — wow, she really is a beautiful woman. For all the excellent things I have to say about the actors and the setting, the core element that holds this movie together is the amazing screenplay. It would have been easy to tell another Avengers-style caper but the level of restraint and constant references to Marvel Comics, 1970s-spy thrillers, Pulp Fiction (the best meta-reference in movie history), Community (yes, Abed shows up), and past Marvel movies makes this something special. I enjoyed every second of Captain America: The Winter Solider. From the introduction of Batroc, to the old school version of Zola, to the well-designed construction of double-crosses (and some were obvious), to the after-credit tie-ins to Age of Ultron, I can’t give a higher recommendation. See this in the theater. The Falcon flight scenes alone are worth the price of admission. It’s a fun movie no matter how you look at it. It just a bit too serious at times is all. Nice review. Took my kids to see this Saturday afternoon. We all had a great time and I was so proud that my little AfroNerdlings picked up on some of the easter eggs. We were disappointed, though, when we went to Toys R Us afterwards and couldn’t find any Falcon action figures. There’s a Red Skull action figure for CA: TWS, and he’s not even really in the movie!, but nothing for The Falcon?! What’s up with that?! You are spot on in this review and I too couldn’t say enough great things about this movie. Unable to break it down like you did so eloquently, I simply put it like this- It’s the first suspense/ dramatic movie that happened to have Super Heroes in it. Nuff Said!